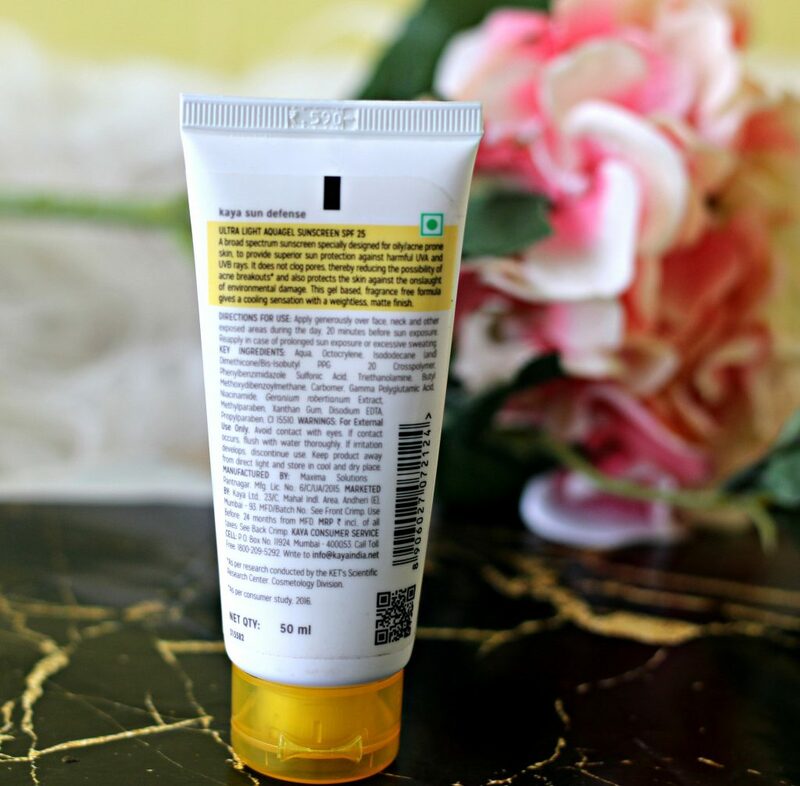 While using a sunscreen is unavoidable during daytime, especially in summers, it’s easy to get confused with the wide range of sun protection factors (SPF) available in the market. In order to ensure you pick the right product, pick the one that suits your skin type. Only the type of sunscreen which is meant for your skin type can provide maximum sun protection. The facial skin is comparatively thinner than the rest of the body. The one that suits the skin will keep it protected from the harmful UV rays of the sun and won’t lead to breakouts which normally happens when you apply an SPF that does not suit your skin type. If you have a skin like I do, Which tends to turn a lot oilier during summers, The best way is to use a gel type/water based sunscreen. Something with a cooling effect on your skin and soothes acne prone skin. 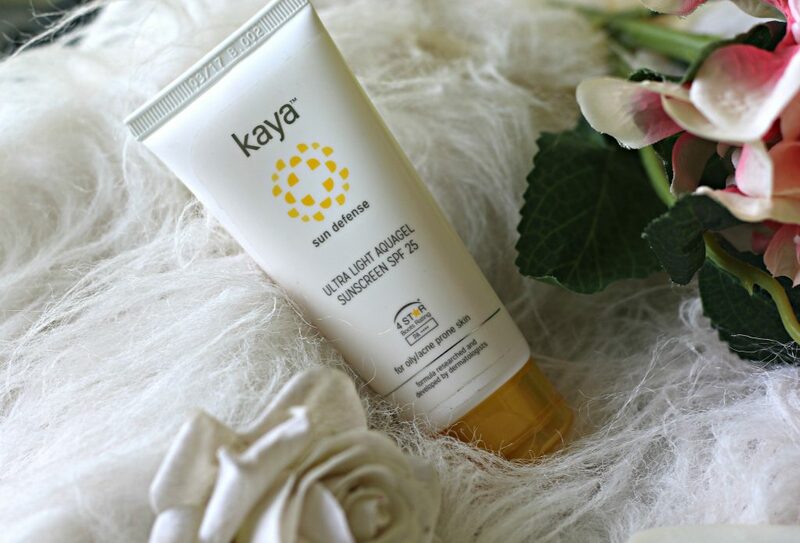 Kaya Ultra Light Aquagel Sunscreen SPF 25 is a broad spectrum sunscreen specially designed for oily/acne prone skin to provide superior sun protection against harmful UVA and UVB rays. It does not clog pores, thereby reducing the possibility of acne breakouts and also protects the skin against the onslaught of environmental damage . This gel based, fragrance free formula gives a cooling sensation with a weightless, matte finish. Packaging & Price – Retails for INR 590 for 50 ml. It comes in a convenient tube packaging. It’s thus hygienic to use. You can pop in your handbag and pretty much carry anywhere you like. 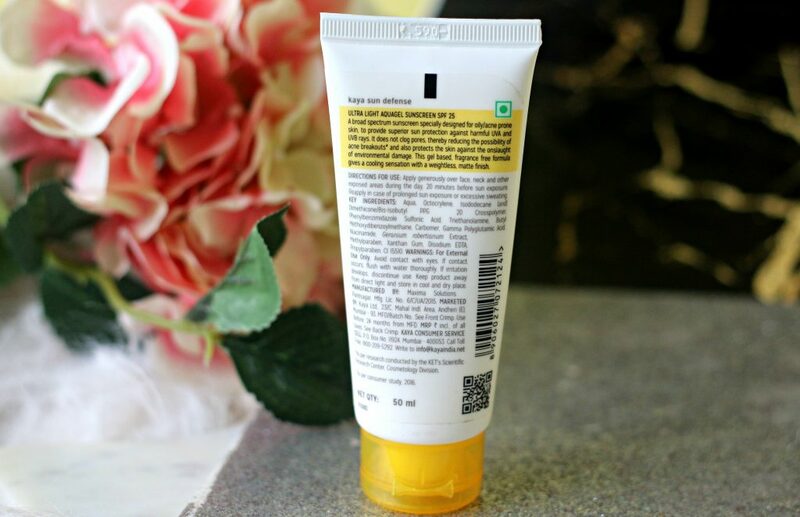 In the packaging tube rear, important product related information such as ingredients, price, shelf life etc is mentioned. Aqua, Octocrylene, Isododecane (and) Dimethicone / Bis Isobutyl PPG 20 Crosspolymer, Phenylbenzimidazole Sulfonic Acid, Triethanolamine, Butyl Methoxydibenzoylmethane, Carbomer, Gamma Polyglutamic Acid, Niacinamide, Geranium robertianum extract, Methylparaben, Xanthan Gum, Disodium EDTA, Propylparaben, CI 15510. 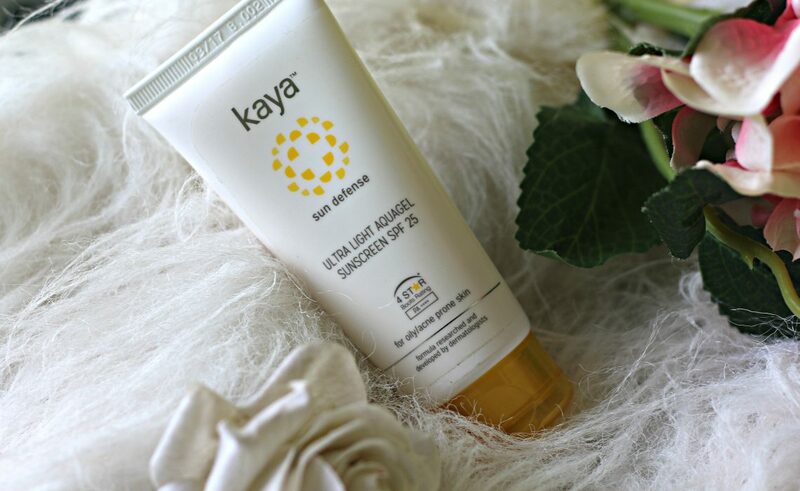 Kaya Ultra Light AquaGel Sunscreen comes in an off white color gel and it has a slightly creamy consistency. It comes without any fragrance. I have a combination skin with oily t-zone and dry cheeks. Additionally, my skin is acne prone and has acne and blemishes by birth. 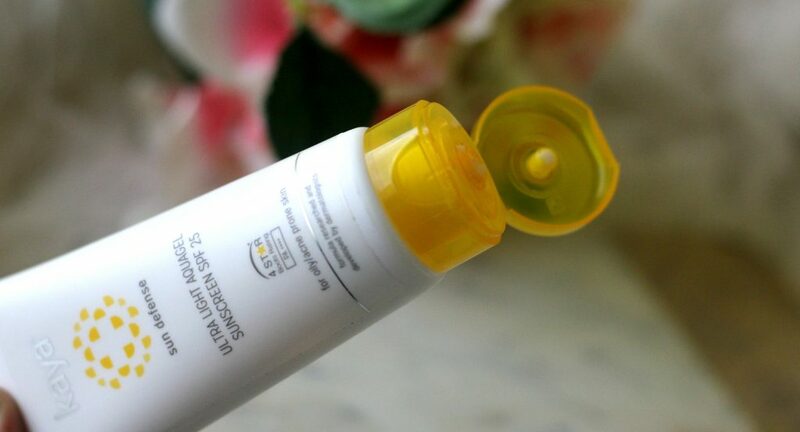 I religiously apply sunscreen everyday without fail.I was particularly excited about trying this one as I never really tried any skincare from the brand. One downside I felt is as it’s SPF 25, you might want to reuse it several times during the day. Next best thing I love about this is – It’s fragrance free and it doesn’t make my face look greasy. It’s matte finish is very light weight on skin and sit comfortably under the makeup too. Also, like some other sunscreens in the market, this one doesn’t made my eyes appear watery as well. Also, no excessive sweat etc. It’s also great for someone who don’t want to wear any makeup, but can’t skip a sunscreen. As it has a comfortable matte finish, it is perfect for day wear. 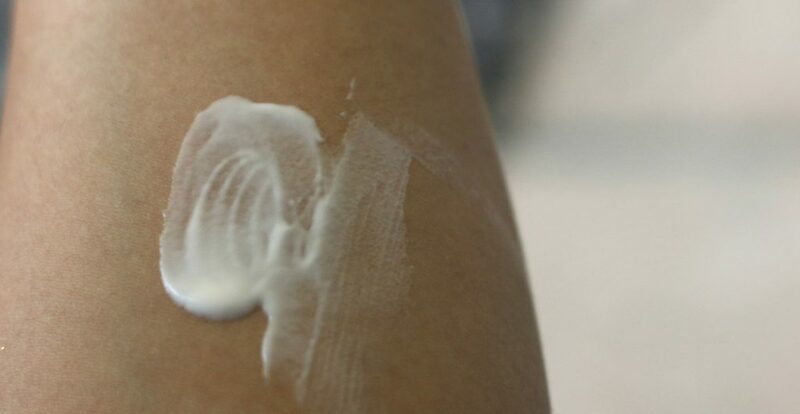 Normal skin: A SPF that is lotion based is best suited for normal skin. 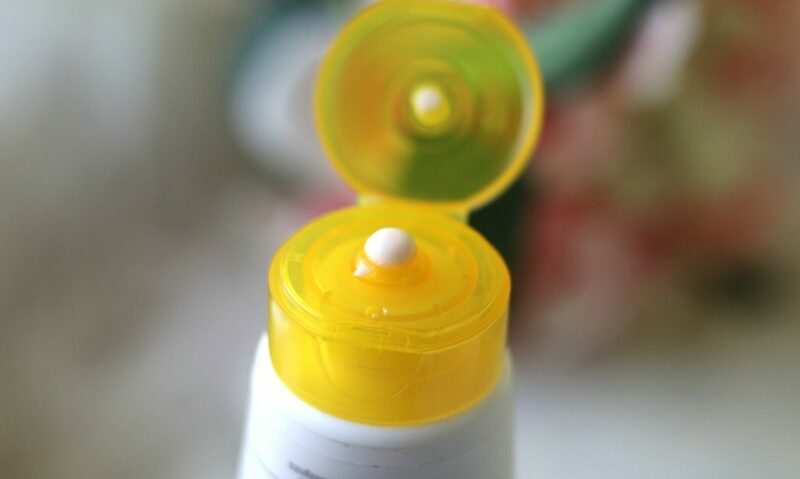 As your skin is not too oily nor too dry, the lotion based sunscreen will provide the right amount of hydration that your skin requires without making your skin appear oily. Dry skin: Those with dry skin have a low level of sebum, which make it really sensitive. But summers are comparatively better for your skin, so use a moisturising or a thick SPF. While choosing a SPF for your skin, remember to pick one with a little thickness so that it moisturises your skin. Best Sunscreens I have ever tried ! I have not tried any of their products yet but I would give this a try. Thanks for sharing. I’ve never come across this brand before! How cool! I like the sound of a light sunscreen, and Summer is coming back here again soon! This is a famous brand in India. Totally true!! This sounds like an amazing sunscreen. I love a good sunscreen and which does not clog my pores. Great review. Totally true..that’s the first thing I check while buying a sunscreen. Gel based!! So important, otherwise it gets so thick on the skin – i hate that! I need to start using more sunscreen! I’m really terrible for not putting sunscreen on my face….or owning anything other than the usual 50+ spf stuff. 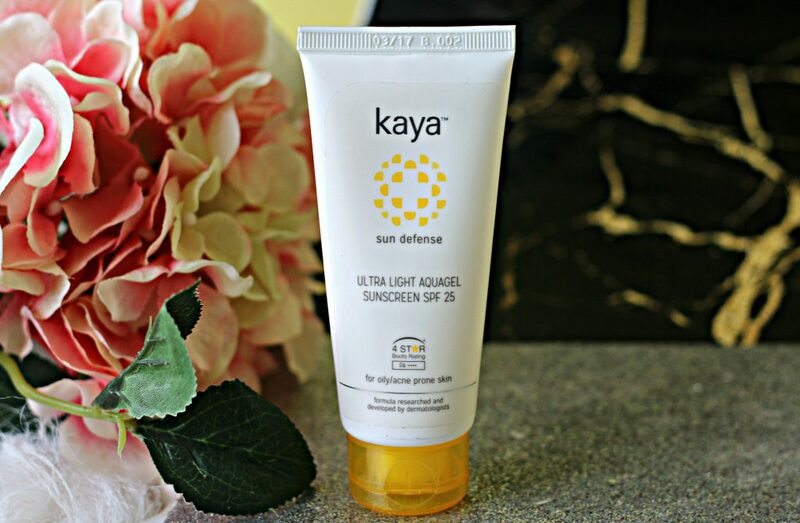 I have heard great things about Kaya’s sunscreen… Currently I am using the one prescribed by by derma.. its working great for me! Awesome!! Would you mind sharing the name here….